TOUR TO KRESTOVKA (short for Krestovsky, it’s a name of a bay – Bay of the Cross) is a wise choice for those, who enjoys outdoor, likes being in touch with nature, wants to stay in a log cabin near the lake. 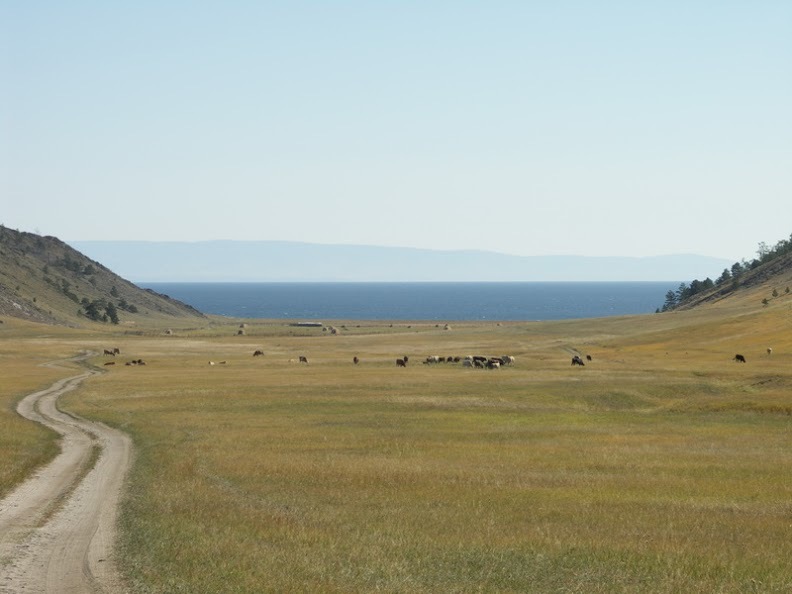 This tour is recommended as a main tour or combined with OLKHON ISLAND TOUR. Also, you can take Krestovka tour and continue to Olkhon on your own (or with my assistance). You’ll be picked up at my hostel or any other place in Irkutsk at 10am. Vehicle: a 8 seat minibus or a car. Our first part of the journey is a drive through vast open spaces – so called Buryat Steppes – where we eventually can see the herds of cows and horses on green fields. In 2 hr we will take the right turn. The landscape changes from being flat to hilly. After another 70km, we find ourselves near the village Petrovo. From there we will have to through the forest. We finally reach the farm by 1.30 – 2 PM. Our outwardly restrained hosts already cooked lunch and prepared the cabin. The log cabins have wonderful view to the lake. Toilet is outside. After check in, we take 2 hr walk to the lake and the hill nearby. Walking to that hill reveals how good you are for our tomorrows 12 km hike. If you have heart problems or your knees or legs hurt or you seriously overweight or absolutely unfit – you may experience serious difficulties during this tour! From the top of that hill we will see amazing panorama of the lake and surroundings. Also, we will be using a man made path, built probably between the 6th to the 12th century of our era. It is not clear why those people would need to built that path. Accommodation in the log cabins, towels and leanings are provided. Occupation usually 2 people in 1 room, but sometimes we are given larger rooms with 4 beds. Hiking to the White Wall. The White Wall – a white marble cliff with ancient drawings. Those are drawing of humans (shamans or may be aliens), birds and animals. PS. The present condition of drawings is poor – weather and graffiti ruin the marble. Hike to the White wall is not only about those drawings. It’s a combination of walking though the unspoiled beautiful area and seeing an amazing lake Baikal. We reach the White Wall in 3 hr or so. While you observe the drawings, your guide cooks picnic style lunch. We return to the farm tired but happy. Retuning by road to Irkutsk by 2-3pm. Stop for a cup of coffee and snack (not included). Overnight in Irkutsk at BAIKALER HOSTEL can be arranged for extra charge. private car (and driver) transportation, 1 night accommodation, meals as noted (day 1: L, D, day 2: B-L) , local guide-interpreter services, no hidden costs.